I have crossed the Rubicon twice with a new fountain pen I bought in the last couple of weeks and have been using frequently since then. I never thought I would buy a fountain pen that is a cartridge filler and a Montblanc! Among fountain pen collectors, Montblanc pens have acquired a reputation for being overpriced and the important aspect is the brand rather than quality. On the other hand, they are often what people think of when looking for their first luxury pen and that can lead to a degree of reverse snobbery in the soul of the serious pen collector and user. Their marketing can also be off-putting and pretentious; most famously the frequently-quoted claim the plastic their pens are made from is ‘precious resin’. What’s so special about a fountain pen using a cartridge? Above a certain price point it’s expected that a fountain pen should become a piston filler of some sort. There’s something tremendously elegant about filling a pen from a bottle — especially those beautiful bottles that look like they came from the 19th century. This pen is a 147 traveller that is the same same size as the 146 Meisterstuck but instead of the piston filler there’s a clever little sledge that holds to short international cartridges; one that’s in use and a spare. As the pen also comes with a leather case with slots for 6 more cartridges I make that 6ml of ink. For comparison a Montblanc 146 holds around 1.75ml of ink. I reckon it lives up to its name and is the perfect pen for travelling. One pen, lots of ink and no hassle with bottles. There are other solutions but this works for me. I wanted to try a Montblanc and this is an pre-owned pen so that little bit cheaper. I wanted to choose a Montblanc that isn’t the usual black cigar-shaped pen with gold trim. 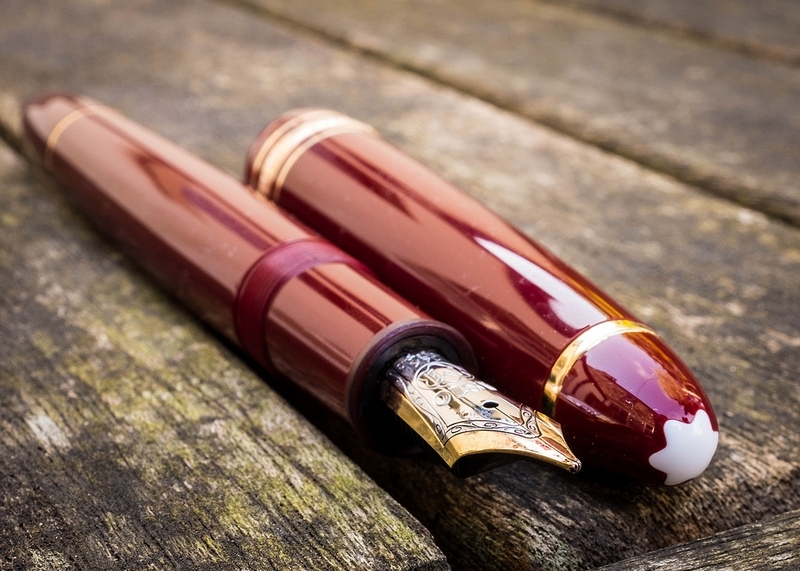 This is a gorgeous Burgundy cigar-shaped pen with gold trim.